Kyoko Takezawa is an accomplished violinist from Japan, and is a highly sought-after soloists with many leading orchestras in the world. She has recorded on both BMG (Bertelsmann Music Group) and RCA (Radio Corporation of America). Kyoko Takezawa started learning the violin at a young age of 3, and by 7, she has toured the United States, Canada and Switzerland as a member of the Suzuki Method Association. At 17, she entered the Aspen Music School and continued her violin music studies at The Juilliard School, graduating in 1989. Ms Takezawa played on the Hammer Stradivarius for her orchestral performances. The violin was on loan to her by the Nippon Music Foundation until it was sold in 2006 for a then-record price of US$3.544 million. In 1982, Ms Takezawa came in first in the 51st Annual Japan Music Competition. 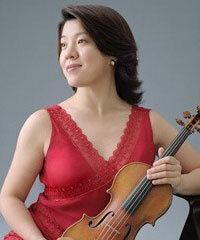 In 1986, she was awarded the Gold Medal at the Second Quadrennial International Violin Competition. As an internationally acclaimed violinist, Ms Takezawa has performed as soloist with world-renowned ensembles such as the New York Philharmonic, the Boston Symphony Orchestra, the Philadelphia Orchestra, the Chicago Symphony Orchestra. She has also performed at major venues around the world, notably Carnegie Hall in New York, the Kennedy Center in Washington D.C., London’s BBC Proms, Musikverain in Vienna and Suntory Hall in Tokyo. As the co-director of the Suntory Festival Soloists of Suntory Hall in Tokyo, Kyoko Takezawa has the privilege to work with the late Isaac Stern, Yo-Yo Ma, Wolfgang Sawallisch, Joseph Suk, Pinchas Zukerman and many accomplished artists. Below are the violin music recordings by Ms Kyoko Takezawa. To listen to a short music sample of the whole music set, click on the link.